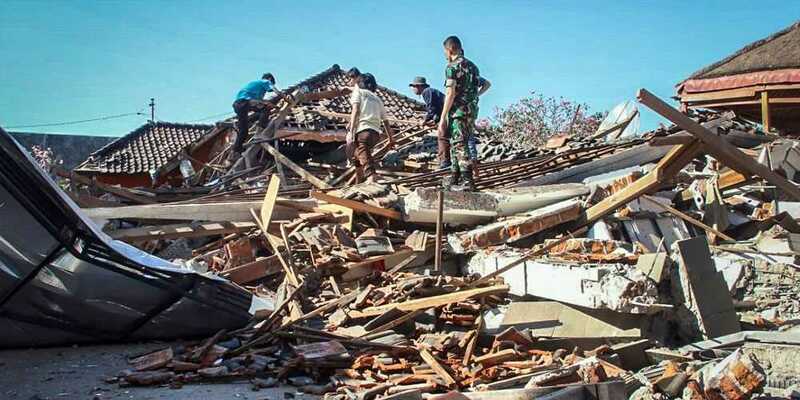 The death toll from Monday's 6.9 magnitude earthquake on the Indonesian island of Lombok has risen dramatically overnight to 347, with state-run news agency Antara issuing the new figure. But disaster agency spokesman Sutopo Purwo Nugroho said in a statement the information from those sources was incomplete and hadn't been cross-checked for duplication. He has said several times that the number of deaths will increase. An interagency meeting will be held Friday to compare information, Nugroho said. Water, which has been in short supply due to a prolonged dry spell on the island, as well as food and medical supplies were being distributed from trucks. Nearly 1,500 people have been hospitalized with serious injuries and more than 156,000 have been displaced due to the extensive damage to thousands of homes. At a collapsed mosque in Bangsal district, emergency workers in orange uniforms removed a woman's body from the ruins on today. The quake was the second in a week to hit Lombok. A magnitude 6.4 earthquake on July 29 killed 16 people and cracked and weakened many structures, amplifying the damage that occurred in Monday's quake.